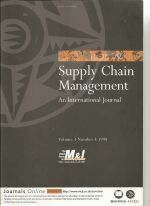 Supply Chain Management. Vol. 3, No. 4, pp. 203-213. This article shows that, as rules of the game in industries change over time, successful firms can achieve substantial competitive advantages through co-operative inter-firm arrangements. In the case of the Dutch potato industry, which went through a process of considerable concentration in the past two decades, cooperative strategies between medium-sized firms lead to advantages in access to high-quality resources, production capacity, and large customers. Consequently, managing inter-firm co-operation has become a strategic issue for firms involved.